The Independent Label Market will be returning to Old Spitalfields Market this Saturday 12th July for the fourth Summer market in London (supported by AIM – the Association of Independent Music). For the second time, The Independent Label Market is also partnering up with London Brewers’ Market, which will feature a selection of local breweries from the London area, such as The Five Points Brewing Company, Brixton Brewery, Camden Town Brewery, Fullers,Meantime Brewing Co. and many more. Ahead of this Saturday’s event, Giuseppe Zevolli spoke to Christopher Tipton, UTR founder – just one of the many labels who will have a stall at this weekend’s event. Check back this week for a series of interviews with other labels involved in the market. GZ: When UTR started out as a live music promoter in 2003, you described yourselves as a “bunch of kids who were bored of the London music scene”. What disappointed you at the time and what were you trying to achieve? CT: Back in 2003, we were all 20-21 years old, we’d moved down to London for various universities and found each other through going to shows and playing in bands. In the main we were from the provinces and so we’d always expected concerts in London to be truly exciting events to behold. During teenage years we were treated to the occasional trip to Birmingham or Manchester to see gigs, now it was all on our doorstep. The live music scene in London after the millennium was beyond boring, most shows were really expensive, poorly programmed and often in depressing venues that just wanted to kick everyone out at 11pm for a club night. No one seemed to be having fun, the audience were often reluctant to engage in anything other than passively observing. All these things were playing in the background when we heard that Deerhoof weren’t coming over to the UK on their first European tour. Because of funding on the mainland, European tours at that time usually opted out of visiting the UK, due to low guarantees and the high costs of the ferries required, visas etc. Deerhoof were our favourite band at the time and so if we wanted to see them play we’d have to set up a show for them ourselves and convince them it would be worthwhile. It was a real shot in the dark but after talking to them it didn’t seem out of reach and so we committed to the show. As soon as we’d booked the band then we needed to think about putting on the event. I came up with the name ‘Upset The Rhythm’ and we held an impromptu meeting in our prospective venue, Needles (an Italian winebar with a big dancefloor off Great Portland Street). This must’ve been mid-September 2003, our show was booked for December 12th so we had time to work out what we wanted to do. After chatting about all the things we didn’t like about the shows we’d been going to we decided Upset The Rhythm would be the opposite and hopefully better as a result. Our aims were simple, we wanted the show to feel as vital, fun and inspiring as it should be, nothing short of a breath of fresh air! Since that first show we’ve just kept that up. We focus on imaginative lineups, interesting venues and breaking down the distance between artist and audience, we want to do this whilst paying bands fairly without overcharging on the ticket price. We try and book only bands we really love, hunt out new venues, make sure the sound is good, make posters, colour them in, stick them up in record shops and flyer similar events. Upset The Rhythm has always been a totally DIY venture, although I don’t think we even realised that was something to be acknowledged or proud of for ages. We have never been funded or sponsored and exist only by our own means. True independence. A decade later, what is your take on the London music scene today, especially if you compare it to the expectations for change you had back then and the role that UTR has now within it? Ten years later and a lot has changed, some great venues have opened up and closed. Some terrific bands have formed and called it day, yet we’re still here! How odd! The music scene is healthy in London today, more and more people are setting up DIY shows and supporting new bands, which is something I’ve always felt strongly about, hopefully that is something we’ve inspired (at least in terms of seeing how achievable it is). If I have one criticism to levy with live music in London though it would be that it’s not very joined up. It can be very tribal and exclusive sometimes. I’ve always wanted Upset The Rhythm to be as all-embracing as possible, just reflecting a personal taste in music regardless of genre. So I’d always argue for a bit more diversity and roads rarely taken. Good music is good music, it all needs supporting. We’ve done shows with Sunn O))) as well as Michael Chapman, with Eyeless In Gaza as well as Oneohtrix Point Never. There aren’t many similarities between Group Doueh and Grouper, or Whitehouse and Lonnie Holley but we love music and want Upset The Rhythm to be an extension of that, as that’s the only way it can feel natural and sincere. Everyone who reads this should support DIY Space For London too as they’re taking on the task of setting up a dedicated DIY venue to support the arts in the city, something well overdue and needed more than ever with the impending closure of The Grosvenor this month. What about the transition to starting your own record label? 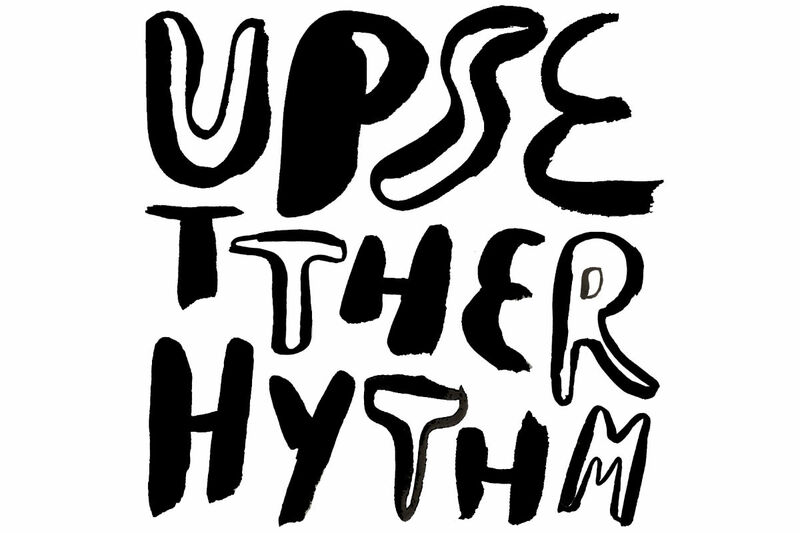 The label side of Upset The Rhythm began in 2005 and its origins almost mirror how the promoting began. We had done recently organized another show at Needles (this time with added stage and stereo PA, even monitors people!) for Xiu Xiu and we were lucky enough to have this band called CRACK: We Are Rock supporting them. The band had some time off in London and ended up staying with some of us for a few days during which time Kim from the band shared with us some recordings of her new project called Death Sentence: Panda! They were a loopy trio of SF punks making bewilderingly awesome music with hollered vocals, pitch-shifted clarinet, flute and drums! It transpired that they didn’t have a label already interested in wanting to release the songs we’d been so overjoyed to hear and so in utter disbelief that this music wouldn’t get heard otherwise we decided there and then to start a record label to share it with as many people as possible. We’d already saved some money from our show promotions to help bank roll less popular ventures and so it didn’t look impossible. A few weeks later we helped set up a show for The Evens in London, it was their first time over and our event at St Cyprians Church in Baker Street was exceedingly busy, bolstered by a somewhat outré lineup with Penny from Crass doing a poetry reading and Hugh Metcalfe slapping his guitar along to some mysterious film projections whilst wearing a tea cosy in the shape of a cabbage on his head. Kerazy times! It was as weird as it was wonderful and the show sold out on the door within the hour. After The Evens had blown everyone away with their neat outline of punk, we decamped with the band into the cleric’s office to go through the ticket sales and pay them. We hadn’t thought to keep any money back for future shows as it was such a source of pride to work on this one regardless but Ian MacKaye made a point of not accepting the epic envelope of cash straight off. He asked us about what we wanted to do with Upset The Rhythm and we mentioned how we’d started thinking about our first release as a record label and talked about how we had Lighting Bolt playing in London a few weeks later. At this point he literally halved the money and made us take our share to put towards that first release. For this act of generosity, Ian has become known affectionately as the spiritual uncle of UTR, ‘Uncle Ian’ if you will. The funds from that show allowed us to put the Death Sentence: Panda! 10” album into production immediately, that in turn led us to book our first tour when the band came over the following April to promote the release, and so the snowball gathered speed. The other remarkable thing that came out of that Evens show looking back at it, was that for the first time I think we valued ourselves as promoters; all the time, effort and photocopied posters weren’t forgotten on the night bus home, this time we had a record to show for it! The record label organically grew out of the live shows and the following few records by Trencher, John Maus and Leopard Leg were all taken on after we’d just had the acts perform at show. The same way one show led to another, often by word of mouth between bands the records followed suit, working with BARR put us in touch with Former Ghosts and No Age, who linked us up with Lucky Dragons and High Places. Working on shows with Dan Deacon led to our long relationship with Future Islands. Throughout these American releases we’ve always felt it vital to support underground UK bands too because the majority of labels in the UK seem to take what’s on their doorstep for granted. Releases by Trash Kit, Peepholes, Munch Munch, Way Through, Gentle Friendly, Silver Fox and our split LP series (Please, Spin Spin The Dogs, Ravioli Me Away, Dog Chocolate, Apatt, Chops etc.) are some of most important and rewarding to us. Were there any labels from which you took inspiration in terms of style, aesthetic or ethos? I think every record label looks at those who came before them and our some of our biggest influences at the time were Slampt, Dischord, K Records, Guided Missile, Rough Trade, Kill Rock Stars and Sublime Frequencies. I think it’s really important for a record label to have a strong identity and stand up for quality music. All these labels had a sense of discovery and enthusiasm about them that proved contagious as well as documenting a scene. That’s certainly something we’d like to impart via the record label too, it’s not only a test of faith but a test of permanence too. Records as a record of something. Were there any particular struggles along the way or do you think UTR as a label has maintained a sense of equilibrium over the years? I think the only difficult thing to get your head around with starting a record label is that you will lose money at times. A lot of people think that you only have to cover the manufacturing of the physical product and leave it at that, but if you take running a label seriously there are a lot of hidden costs in terms of recording costs, promotion and tour support. Also, not every release will break even despite how great it is. It’s a tough fact in such a crowded marketplace, there’s only so many publications or blogs that are considered significant by the distributors and shops who deal directly with sales. If your record hasn’t been reviewed in some of the right places, shops are reluctant to take the release. With so many releases coming out each week and so few opportunities for reviews this is a pressure every label feels I think, especially if they are DIY and do most of the PR themselves. However, enough with the doom and gloom, stick with it and the releases that do better than the others support the label’s continued progress. It’s hard to get the wheel going but once it’s moving you just have to keep up. This brings me onto one of the other problems most DIY labels encounter at some point, larger labels muscling in. As soon as a band gains ground and starts getting good press and sells well then you guarantee that larger indie labels will notice and start approaching the artist. With their ability to offer large advances and a tried and tested machinery in place for radio/press and tours, it’s no surprise that most acts will sign to the bigger label, yet it is still disappointing when it happens. You have to be very philosophical at times when running a record label and it’s hard to escape the ‘music industry’ defining your role. Thankfully I largely see that as supporting musicians when they need it, at the start of their career, when no one else wants to know, and that goes for the live dimension of Upset The Rhythm too. From noise to experimental folk, post-punk etc. UTR always seemed to defy genre-specificity. how do you seek out bands and what do you think clicks with UTR across genres? Is omnivorousness more important than shielding a particular set of values? I think I’ve touched on this previously but yes, I find putting bands into genres terribly limiting and unhelpful. I’d prefer Upset The Rhythm to represent a personal taste in music, rather than narrowing the horizon of the acts we work with and the audience we reach. I mean, who only listens to garage, or house or jazz or noise? It’s not an honest approach. Plus, there are huge overlaps with some bands and I must admit it’s usually the differences and curve balls that make a label or lineup interesting. I’d rather be a fan of music than a fan club, that way there’s always a new door opening. Distribution has always been a ‘crux’ for independent labels. What was the experience of UTR? Upset The Rhythm has always been incredibly lucky in this aspect. I started up the label whilst I was working for Southern Records, in charge of tour promotions. Southern believed in the new label from the get go and alongside SRD have taken care of this for us with the greatest ease and gusto. I am eternally thankful for such good luck as I know it’s difficult for most new labels to be taken seriously initially and to have distribution in place for your first record (and that also being a single-sided 10”… oh dear!) is amazingly good fortune. Seven years ago, chatting with DiS about the challenges and opportunities of the digital world, you said that besides the online presence of the label with the blog, YT channel, mailing list etc. “physical records will remain the priority”. What would you say on the same topic today, in light of the debates on streaming platforms and the musical ‘overload’ of the Internet? I’d maintain that same position, I think the Internet is an invaluable resource for discovering new and old music alike. I think it has democratised people’s exposure to music so you no longer have to have lots of money and live near a record shop, that’s a brilliant thing. It also allows band’s to share their music with the world in a matter of minutes for free if they wish, that’s very liberating. There is an overload of music but you can’t tell people to stop making music, you just have to get better at finding the gold. Youtube advertising makes listening to music tedious, streaming is better but the return to artists is pitiful and bypasses any real feeling of ownership of the music. This is why I still think physical records (especially) and CDs, tapes are important, I know I like to have the first pressings of the albums I like most. There’s a tangible discourse that you’re having with the release then, a connection is made between the listener and the artist through a common object. I know it’s probably horribly old fashioned to say that the same connection can’t exist with digital files but for me it’s about the ongoing preserve of the medium and the act of contributing to the historical process that maintains its popularity. Materialism aside, doesn’t it also feel awesome to own a record? It’s a piece of affordable art that can make your life better and you can hold it in your hand. By buying it you support not only the label and artist who made it but also the manufacturers, the distributors, the press people and record shop staff who all helped to make you put it on the turntable and start dancing erratically around your living room. Well done! The recent BARR show at Power Lunches seemed to be a special moment for UTR. His two records are emblematic of the cutting-edge material the label has released since the very beginning. How was it to put on that show after all these years? Thanks for picking up on that. Brendan Fowler is such an important member of our UTR family, his limitless zeal and positivity are a constant inspiration. To have BARR perform at Power Lunches felt like such a quantum leap moment, as if we’d leaped from 2005 into the perfect scenario nine years later. I loved the way Brendan had deconstructed some older songs whilst the new ones slotted right into place. I don’t think any of us expected to have BARR play again after his visual art career took off, so we were overjoyed that we could help make this happen. His music still sounds like nothing else this side of the future and it was pleasing to see how much he still meant to people. What can we expect from UTR in the near future? On the horizon I’m very excited about our crop of new releases, next in the pipeline is an EP from Spray Paint, who hail from Austin. They’re super motoric and locked-down, minimal punk with all three of them singing at the same time. Then after that we’re working on a self-titled rage of an album for VEXX from Olympia, this one is a split release with our kindred spirits M’Lady’s Records and should be out in September. We also have albums from Trash Kit and Wet Dog that are in the latter stages of mixing too. In terms of shows I’m always most excited for whichever the next one is, as I kind of live and die by the thought that you’re only as good as your next show. I don’t have much time for resting on my laurels or backslapping etc., I keep working on new events and records because that’s what I enjoy doing. Upset The Rhythm seems like the opposite of most jobs in that respect, pretty much anything can fall on my lap from day to day, it’s that unpredictability that endures and makes it so fun.